Well it's been almost three years since the end of my nine-month study of interactive advertising across the web. My intention was to take a break for at least a year and resurface to revisit all those industries again. One year turned to three, but I think the extra time will actually make this more interesting. My plan is to revisit a majority of the industries from the first study and hopefully a couple new ones. 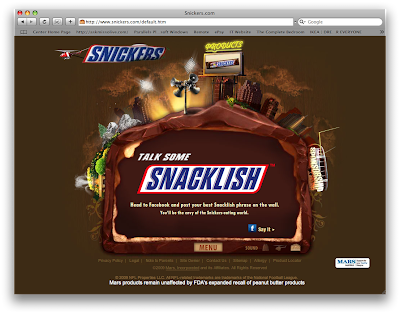 The very first industry was Candy, and the first site was Snickers. Wow. Almost three years later and we're still looking at the same site. 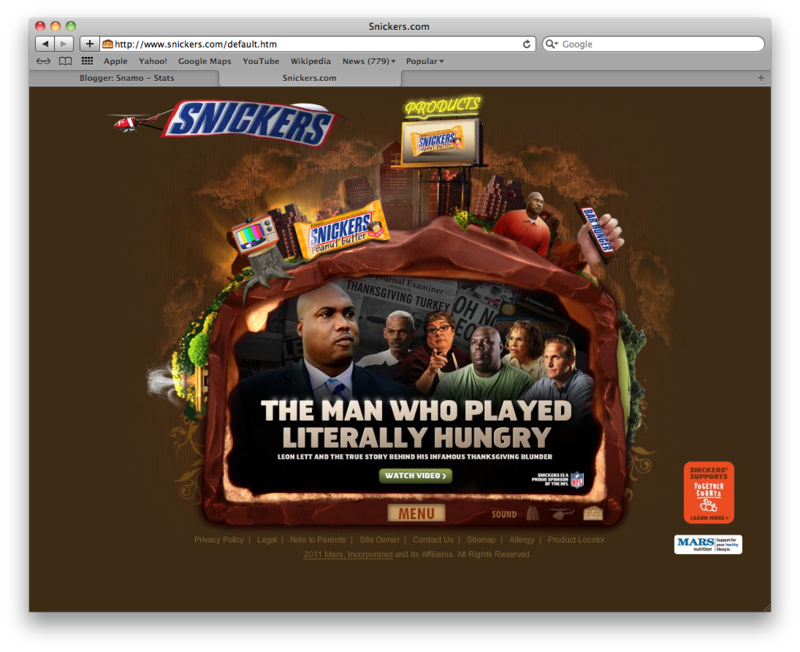 It either performs extremely well, or a Snickers website is at the bottom of the priority list. So much has happened in these years, from the big corp rush to Facebook to mobile sites becoming a necessity. It's as if time has stood still here. Checking this site on my iPhone shows a "Download Flash to see the World" message. I don't see a link to their Facebook page on here. Last I checked they had 40 fans. Holy crap. 2,842,371 likes. Apparently Social works pretty well for Snickers. Judging by the amount of wall posts and engagement they have going on, I'm starting to understand why the site (barring new content) is a low priority. One of the more important questions I want to answer for myself through this new study is the affect of social on true interactive websites. Here we see the website sitting on the sidelines while social plays ball. Or is it, to use an analogy, like Solo play vs. Multiplayer in video games, a duality where each part can be the star depending on the game. Like a Skyrim (solo play) vs. Battlefield 3 (predominately multiplayer with so-so solo play) vs. MW3 (equal parts great solo and multiplayer). Looking forward to exploring the landscape again.